Once you have decided to attend college, finding the right school is the next essential step. Those considering an education in Virginia will have over 110 colleges and universities to choose from, with a broad selection of 2-year and 4-year degree programs across a number of fields of study. 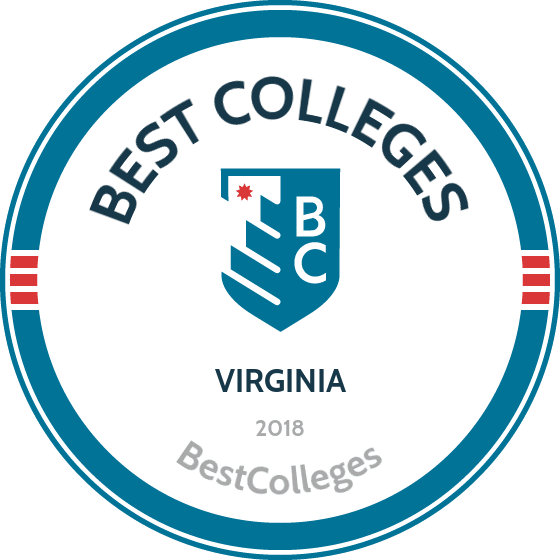 To assist you in this process, we have applied our rigorous methodology to the latest education data to rank the best colleges in Virginia, including the top four-year and two-year schools. If a bachelor-granting institution is what you have set your sights on, Virginia is a great place to pursue a degree. The state's 25-plus public and private universities include one of the nation's oldest, William and Mary College, which is also considered the original Public Ivy. Additionally, Virginia has seen a steady increase in 4-year graduates since 2011, when the state enacted the Top Jobs Act, an initiative that promotes degree completion across all demographics. According to the Council of Higher Education, Virginia's goal of 100,000 annual bachelor graduates will be met by 2025. To aid your search, below is a list of the best 4-year institutions in the state. Founded by Thomas Jefferson in 1819, the University of Virginia, is ranked among the top 25 national universities by U.S. News & World Report, and is widely ranked as one of the top colleges in Virginia. The university’s main campus is dominated by the central lawn, or Academical Village, which fosters cross-disciplinary exchange by placing professors in multiple disciplines side-by-side within close proximity to the student body. The campus is renowned for its beauty, and it was named a UNESCO World Heritage Site in the 1980s. Virginia features 11 unique schools, and the university offers a variety of innovative undergraduate majors. The school’s exceptional degrees include bachelor’s programs in interdisciplinary studies and urban and environmental planning. Additionally, the school’s aerospace engineering degree is worthy of a mention here, as it’s an important part of the university’s partnership with NASA and the department’s efforts to solve more of our solar system’s mysteries. Founded in 1749, Washington and Lee University, is one of the oldest colleges in Virginia. The university’s front campus was designated as a National Historic Landmark by the Department of the Interior in the 1970s. Washington and Lee operates under a student-run Honor System, an agreement that no student will cheat, lie, or steal while on campus. Under this rule, students are allowed to schedule and take their own final exams without supervision. Washington and Lee offers more than 50 undergraduate majors and minors in a variety of disciplines. Students can study the arts and humanities, social and natural sciences, engineering, journalism, and more. They can also pair their baccalaureate degree with a variety of minors, including popular programs in poverty studies and latin american and caribbean studies. More commonly known as Virginia Tech,Virginia Polytechnic Institute and State University, is one of the largest colleges in Virginia. Virginia Tech's campus encompasses more than 2,600 acres, and the university also owns a nearly 2,000-acre agriculture research farm just off campus. Virginia Tech is the state's leading research university, and it offers more than 280 undergraduate and graduate degrees to 34,000 students. The school offers more than 110 undergraduate majors and minors across a variety of colleges and schools, including the College of Agriculture and Life Sciences, the College of Natural Resources and Environment, and the College of Engineering. Virginia Tech offers a variety of innovative programs, including a degree in sustainable biomaterials, one of the most renowned natural resource science programs in North America. America’s first state-supported college, the Virginia Military Institute, prepares students to overcome adversity. Unique among colleges in Virginia, students at the institute are known as cadets, and they wear historic uniforms and live together in the campus barracks. The campus is a self-contained community that provides a variety of support services, including a barber shop, post office, and a tailor. VMI instructs almost 2,000 students each year. The Virginia Military Institute is one of the country’s smallest military colleges, which allows each student to get individual attention from faculty members. VMI has a robust engineering department, and the school offers an array of civil and environmental engineering concentrations, including construction management and hydrology and water resources. The school also features an excellent international studies and political science degree that incorporates foreign languages, history, and economics into one rigorous discipline. The University of Richmond, combines the extensive resources of a large research university with the individualized education typically found at a small liberal arts college. The university maintains an 8:1 student-to-faculty ratio, and in 2015, no school granted more Fulbright Scholars than Richmond. The university supports stellar Division I sports programs in baseball, basketball, cross country, lacrosse, and more. Additionally, Richmond also provides plenty of more informal athletic organizations, as about 800 students are involved in more sports clubs across campus. Richmond instructs students in over 60 undergraduate majors. The university has an innovative English program that can be combined with a variety of other disciplines, including the classics, theatre, Greek, Latin, and more. Richmond also offers multiple economics tracks, one for the bachelor of arts and bachelor science degree, and one for the bachelor of science in business administration program. Ranked by U.S. News & World Report as the second best large, master’s-level public school in the South, James Madison University, is one of the best colleges in Virginia. The university has a tradition of providing a welcoming community for incoming students, as JMU currently boasts a 91% freshman retention rate. Additionally, The Princeton Review ranked James Madison as one of the country’s most environmentally responsible colleges, and for good reason: the school’s Wayland Hall was the nation’s first college residence hall to earn the prestigious LEED platinum certification. James Madison serves almost 20,000 undergraduates a year, and provides nearly 80 undergraduate degree programs. JMU’s business programs are especially noteworthy, as they are among only 5% of global business schools accredited by the prestigious Association to Advance Collegiate Schools of Business. The university also has an excellent bachelor’s of arts program in earth science, which incorporates elements of geology, meteorology, and astronomy. The College of William and Mary, is the second oldest college in America, and none of Virginia’s colleges have educated more U.S. presidents than the three who attended W&M. The school’s main campus is located close to historic Williamsburg, and it’s also home to the Sir Christopher Wren building, the oldest college building still in use in America. William and Mary serves more than 6,000 undergraduates and more than 2,000 graduates, and about a third of students are people of color. William and Mary offers undergraduate degrees in the arts and sciences, business, and education. The school’s bachelor of arts in history is particularly well-regarded, and William and Mary is known for its excellent Colonial American history program. Additionally, the school’s business major allows students to simultaneously focus on multiple business fields. Students can also work closely with a faculty advisor to design their own interdisciplinary major. George Mason, occupies nearly 700 densely wooded acres in Fairfax Virginia, and the campus is home to about 6,000 residential students. George Mason is known among Virginia colleges for graduating a number of esteemed alumni, including Anousheh Ansari, the first Muslim female astronaut to visit space, and Zainab Salbi, who has assisted more than 400,000 female victims of war through her nonprofit organization Women for Women International. The university is also home to acclaimed faculty such as Pulitzer-prize winning columnist Steven Pearlstein and Jagadish Shukla, member of the U.N. Intergovernmental Panel on Climate Change. George Mason serves over 34,000 students through 10 schools and colleges, many of whom study online. Not surprisingly, the school offers a variety of degrees. George Mason’s unique programs include the BS in recreation management degree with a concentration in parks and recreation, and the BA in integrative studies with a social innovation and enterprise concentration. Christopher Newport University, emphasizes honor, service, and leadership and embraces the liberal arts and sciences both inside and outside the classroom. The university is one of the most service-oriented colleges in Virginia, and the campus’ Center for Community Engagement partners with local schools and nonprofit agencies to give students the chance to learn through serving their community. Additionally, the school’s President’s Leadership Program develops civically active students through both academic and experiential learning. Christopher Newport’s Ferguson Center for the Arts is a regional attraction, having entertained roughly two million people during its over 600 performances. hristopher Newport enrolls 5,000 students who pursue degrees through three colleges (Arts and Humanities, Social Sciences, and Natural and Behavioral Sciences), plus the Luter School of Business. Students choose from more than 90 areas of study and participate in over 200 activities and organizations. VBC, based in Fredericksburg, offers certificate, associate, bachelor's, and master's programs that are taught through a Christian perspective. At the undergraduate level, VBC's offerings include associate and bachelor's degrees in ministry or Christian education, along with a one-year certificate in Bible studies. At the graduate level, the school offers programs in ministry, biblical studies, and Christian education, along with several graduate certificates. All students are paired with an academic adviser who is familiar with their program. These advisers can assist with course selections, degree completion plans, study strategies, and connections to school resources. Unlike most Christian schools in Virginia, VBC offers a large dual enrollment program for eligible high school students. This program allows students to earn college credit while still in high school. Juniors and seniors with a GPA above 2.5 may be eligible for as many as 54 college credits, allowing them to complete their undergraduate degree faster. From its inception as a women’s college, the University of Mary Washington, has grown into one of the best colleges in Virginia. The university has several notable features, including the Hurley Convergence Center, a high-tech, multi-purpose academic commons, and the University of Mary Washington Galleries, which houses a permanent collection of over 5,000 pieces of art. Over a third of all Mary Washington students study abroad before graduating, and the university runs programs in countries throughout the world. Mary Washington offers over 60 degree programs. The bachelor of liberal studies program is designed for non-traditional and adult students and is based in the arts, sciences, and humanities. Business students can specialize in a number of fields, including French, German, and Spanish minors designed specifically for professional settings. Additionally, students can develop custom “special majors” by combining several courses of study. Virginia Commonwealth, is a diverse, urban institution and one of the top public research colleges in Virginia. While about half of the university’s students identify as white, 12% identify as Asian, 16% as black, and 7% as Latino. Additionally, more than 100 countries are represented in Virginia Commonwealth’s student body. VCU’s faculty are particularly distinguished, and ten professors and alumni have received Guggenheim Fellowships since 2002. Virginia Commonwealth supports a student body of more than 30,000 students and offers more than 60 undergraduate programs. More than half of all undergraduates study in the College of Arts and Sciences, where they can pursue a number of degrees, including an interdisciplinary science program which offers concentrations in biology, chemistry, physics, and more. The school’s bachelor of arts in international studies is also a popular program, and it allows students to focus on either a specific global region, or on a particular global issue, such as social justice. Liberty University, is the largest college in Virginia, and the most populous Christian university in the world. Its campus covers over 7,000 acres, has over 300 buildings, and its total enrollment — including both on-campus and online students — is over 100,000. Despite its size, Liberty maintains a 24:1 student-to-faculty ratio for residential undergraduates. Liberty supports faith-based service through its Center for Christian/Community Service, which connects students to service opportunities in local churches, on campus, and in the community. Liberty offers more than 200 undergraduate programs. Degrees include everything from a BS in aeronautics to a degree in music and worship studies. Additionally, the university is known for its excellent online programs; Liberty supports more than 250 online undergraduate, graduate, and doctoral degrees. Named one of the best regional colleges in the Southeast by The Princeton Review, Longwood University, offers a quality education at an affordable price. Longwood prides itself on being one of the most active colleges in Virginia, and it’s easy to see why: all students complete an internship or faculty directed research, the student body has logged more than 58,000 hours serving with more than 100 different organizations, and more than 600 students participate in over 200 clubs and organizations. Longwood offers more than 100 programs and boasts a 17:1 student-to-faculty ratio. In addition to traditional liberal arts programs, Longwood’s academic offerings cover a variety of innovative and specialized disciplines. The school’s sociology program incorporates many concentrations, including a family studies degree. Longwood’s bachelor of science in biology degree includes the biology teacher preparation track. Though Eastern Mennonite University's student body is less than 2,000 strong, the school has made a significant impact that defies its small size. All students study abroad in another region of the US or in other countries like India, Guatemala, and New Zealand. The university is also among the top colleges in Virginia in terms of providing scholarships. The school provides nearly all of its undergraduates with financial aid, and the average aid package is more than $30,000. Though Eastern Mennonite instructs students in a variety of undergraduate programs, the school is particularly renowned for its pre-professional health program: over the past 15 years, 100% of its graduates have gained acceptance to physical therapy school, 94% have been admitted to physician's assistant programs, and 83% have been accepted to medical school. Additionally, 91% of the school's nursing graduates pass their licensing exam on their first attempt. Radford University, was founded in 1910. The campus covers more than 200 acres and, with 15 on-campus residence halls, is a primarily residential school. Many on-campus residents choose to join one of the more than 25 fraternities and sororities that dot the campus. The university employs a renowned faculty team, 11 of whom have conducted international research and taught as Fulbright Scholars since the 1980s. Outdoor enthusiasts will have plenty to do at Radford, as the campus is close to both sections of the Appalachian Trail and the Jefferson National Forest. Radford offers undergraduate degree programs in six colleges. The university has bachelor’s of arts and bachelor’s of science in cinema arts degrees, and students can concentrate on studying performance, theatre history, cinema, and more. Additionally, students can complete a dual bachelor’s degree in physics and engineering in just five years. Founded in 1775 on the eve of the American Revolution, Hampden-Sydney, is a men’s college in Virginia. The school is located on a 1,300 acre campus with plenty of options for outdoor enthusiasts, including three bass fishing lakes, a three-mile mountain biking trail, and a frisbee golf course. Additionally, many famous men have been associated with the college: Patrick Henry and James Madison were original trustees, while Stephen Colbert graduated from Hampden-Sydney in 1986. Hampden-Sydney has been ranked by U.S. News & World Report as one of the finest liberal arts colleges in the country. HSC offers more than 25 majors, including Greek, Latin, and foreign affairs. Additionally, Hampden-Sydney helps students develop their writing and speaking skills through its renowned rhetoric curriculum. Bridgewater College, is a small liberal arts college in Virginia’s picturesque Shenandoah Valley. The college has been named one of The Princeton Review’s Green Colleges, and the school’s Office for Sustainability supports conservation programs and coordinates campus recycling and energy conservation. Additionally, Bridgewater’s Center for Engaged Learning helps students engage in extracurricular learning and service opportunities both locally and abroad. Bridgewater offers an equine science program, and also boasts a distinguished equestrian athletic program. Riders can practice for competitions at the nearby Bridgewater College Equestrian Center in Weyers Cave. Bridgewater offers more than 60 major and minor degree programs. The college’s innovative degrees include a hybrid biochemistry major, along with specialized concentrations in fields such as Iberian studies, equine studies, the American Civil War, and multimedia authoring. Most concentrations can be paired with any major for a customized educational experience. Bethel, located in Hampton, is one of the only Christian schools in Virginia focused entirely on ministry. The school offers diploma, associate, and bachelor's programs. The one-year diploma provides a basic introduction to ministry practices, preparing students for entry-level positions. The two-year associate degree offers more specialized ministry knowledge, along with general education courses that prepare students for bachelor's programs. The bachelor's degree offers advanced knowledge and gives students a choice of five concentration areas: ministerial leadership, biblical studies, missions, worship and worshipping arts, or Christian counseling. Bethel also hosts a selection of non-degree programs. The school is unique for its experiential focus: Bethel students learn through ministering with local churches, outreach programs, Christian education organizations, and home-group programs. Many students also participate in cross-cultural ministry programs overseas through Bethel's network of partner missions. Southern Virginia University, is affiliated with the Church of Jesus Christ of Latter Day Saints and is located in Buena Vista, near the Appalachian Trail and the Blue Ridge Mountains. Nearly all students participate in one of the university’s many extracurricular activities, such as the Irish Dance or Adopt a Grandparent clubs. Southern Virginia is one of the best colleges in Virginia in which to pursue service related activities: all students must complete a 25-hour service capstone project, while those returning from their mission receive a $1,500 scholarship. SVU has a liberal arts focus and an average class size of 15 students. Standout majors include family and child development; a multidisciplinary program that incorporates sociology, psychology, and social work; and a liberal arts program that encompasses history, art, philosophy, literature, and the sciences. Additionally, students can participate in SVU’s distinguished ROTC program, which operates in a partnership with the Virginia Military Institute. Nearing its 200th birthday, Hollins University, is one of the oldest colleges in Virginia. The campus has several historical attractions befitting a school its age: the quadrangle is in the national historic register, while Wyndham Robertson Library was Virginia’s first designated National Literary Landmark. Hollins has been ranked on The Princeton Review’s The Best 381 Colleges list, while U.S. News & World Report reports that the university’s student-to-faculty ratio as one of the lowest among liberal arts colleges. Hollins serves almost 700 undergraduate women and offers nearly 30 undergraduate majors. The school is known for its excellent bachelor’s programs in English literature and creative writing. The English Department has produced several famous writers, including Pulitzer Prize winner Annie Dillard. HU’s bachelor of science/bachelor of arts in biology degrees are particularly renowned, and the university oversees an excellent history program with classes in American and world history. Old Dominion University, is one of the top colleges in Virginia. The school enjoys a vibrant global culture and welcomes more than 1,000 international students and scholars from over 100 countries each year. Additionally, ODU’s Center for Enterprise and Business Development helps enhance and develop business in the Hampton Roads region. The school is also particularly committed to supporting women entrepreneurs through its Women’s Business Center. Overall, the university’s research and business initiatives add almost $2 billion to the local economy. Old Dominion instructs about 25,000 students and supports 70 bachelor’s degree programs. The university has strong business programs, and the bachelor of science in business analytics prepares students to analyze data to facilitate professional decision making. Old Dominion’s online degree programs are particularly renowned. The school offers over 100 online degrees in a variety of disciplines, including criminal justice, finance, human services, and more. Randolph-Macon, located in Ashland, is a private liberal arts and sciences college. The school enrolls over 1,400 undergraduate students and offers over 54 majors, minors, and pre-professional programs,. Undergraduate fields include engineering physics, environmental studies, political science, and computer science. Randolph-Macon has a four-year degree guarantee: if students follow all the guidelines and don’t obtain their degree in four-years, the school waives tuition costs for the remaining, required courses. R-MC was founded in 1830 by the Methodist church; they accept students of all denominations and ethnicities. The school’s athletic programs, which includes 17 intercollegiate sports, are members of the NCAA Division III and Old Dominion Athletic Conference. Student clubs and organization include the Arcade Gaming Society, an Amnesty International chapter, Black Culture Society, and Chess Club. R-MC’s The Edge Career Center gives students networking and internship opportunities and helps build career skills. Famous alumni include former U.S. Representative Randy Forbes, sculptor Jim Sanborn, and writer Pearl S. Buck. The University of Virginia’s College at Wise, is a public liberal arts school located in the Appalachian Mountains. The college maintains a 13:1 student-to-faculty ratio and has an average class size of 17 students. Additionally, the College at Wise campus has a Center for Student Development that provides all-encompassing student support, including counseling, health, and professional development services. The college competes in NCAA Division II athletics in 13 sports, including baseball, basketball, and lacrosse. The school serves over 2,000 students and offers 30 degree programs. The College at Wise is one of only a few colleges in Virginia to offer an undergraduate software engineering degree, and nearly all students in this program find work quickly after they graduate. The college also hosts innovative academic outreach programs, such as the Center for Teaching Excellence, which provides continuing education for PK-12 educators. Virginia's 2-year colleges are a great option for those seeking to transfer to a 4-year school; in fact, every bachelor-granting institution in the state has some type of agreement with their associate-granting counterparts. If you aren't seeking to transfer, these colleges can also provide a standalone education across multiple fields of trade and study -- although, with earning potential in mind, it may be best as a supplement to another degree. A report in 2011 shows those in Virginia with an associate degree make (on average), nearly 40% less than the state median wage. Whichever path you choose, we've compiled the top 2-year colleges below to help you begin. Named for Founding Father Patrick Henry, a proud Virginian, PHCC was established as part of the University of Virginia’s School of General Studies in 1962. It became its own entity in 1964 and was absorbed into the Virginia Community College System in 1971. Today, the Martinsville-based school delivers programming to about 3,000 students. PHCC also runs workforce development centers in Stuart and Martinsville, the IDEA Center in Martinsville, and the Virginia Motorsports Training Center in Henry County. Known for its tech-savvy approach, PHCC offers a variety of degree, certificate, and career-studies programs and personal-enrichment courses. Most popular among them are the general studies, science, and health science majors. Liberty University, Old Dominion University, Radford University, Virginia Commonwealth University, and Jefferson College of Health Sciences are the most common destination for PHCC transfer students. Old Dominion has a transfer agreement that sees students attend PHCC for their first two years and then finish a bachelor’s online at ODU. PHCC was first among Virginia community colleges to participate in the National Junior College Athletic Association, and today fields 11 teams. More than 100 scholarships are available from the school’s PHCC Foundation. Thomas Jefferson once said that he wanted opportunities for higher education “within a day’s ride” for Virginia residents, and Rappahannock Community sees itself as carrying out that mission. Founded in 1969, the school has locations in Glenns and Warsaw, on either side of the Rappahannock River, providing 12 counties with access to transfer degree programs, professional certificates, and continuing education. About 4,600 students are enrolled, and RCC conferred more than 600 degrees and certificates in 2016. Like other community colleges in Virginia, RCC has an extensive transfer program, which includes articulation agreements with 30 different four-year schools in such disciplines as the arts and sciences, business, criminal justice, healthcare, psychology and social work, sustainability, teacher education, and the STEM fields. Applied science degrees are also available in business, nursing, corrections and law enforcement, fire science, general engineering, horticulture, and health fields like respiratory therapy and medical lab technology. RCC has an honors program, dual-enrollment options, and a virtual campus. The school offers “compressed” semesters, accelerated sessions that allow students to earn three credits in as few as eight weeks. Wytheville Community College opened its doors in 1963 to a class of 107 students as a two-year branch of Virginia Tech. Based in the town of Wytheville, the school’s been growing ever since, becoming part of the Virginia Community College System four years later. Today, almost 4,000 students are enrolled, taking classes on the main campus and at satellites in Galax, Marion, and online. WCC offers more than 25 transfer degrees, workforce training, and continuing education programs. The majority of students pursue two-year degrees with the intention of transferring to a four-year program, and their most popular fields of study include: science, liberal arts, general studies, education, and business. The most popular career certificates include machine technology, computer electronics, and early childhood development. WCC has some of the busiest extracurricular activities of any of the two-year colleges in Virginia. Like the other schools in the VCCS, WCC has guaranteed admissions agreements with more than 20 Virginia colleges and universities. Located in the tiny Accomack County town of Melfa, Eastern Shore serves Accomack and Northampton counties. A member of the system of Virginia Community Colleges, the school offers 11 associate degrees to a student body of 800. About 40% of students are enrolled in transfer degree programs, intending to move onto a four-year school; the rest are on career-oriented paths or are high schoolers in a dual-enrollment program. Most attend classes part time, and about 50% receive financial aid. The most popular fields at ESCC are the sciences, general studies, liberal arts, and business management. Classes are kept small, offered on weekdays, nights, and weekends, and taught by experienced faculty -- not teaching assistants. The school has guaranteed admission agreements with 25 four-year schools in Virginia and an active internship program that has placed students at area businesses, government agencies, and nonprofits, and even at NASA. According to ESCC, tuition is approximately 35% of what students would pay at public four-year schools and 10% of the cost of a private university. Based in Abingdon, a rural community in the rolling hills of southwest Virginia, VHCC is one of the 23 schools that comprise the Virginia Community College System. The college’s service area includes Washington and Smyth counties and the city of Bristol, and 3,000 students attend in the average year. Like other two-year colleges in Virginia, VHCC offers a comprehensive array of academic options, including dozens of degree programs, workforce training, continuing ed, and online classes in a wide variety of fields. The liberal arts, nursing, and business are popular among transfer-oriented students; electrician certification is big in trades and tech. The Southwest Virginia Higher Education Center is located on campus, providing students with an avenue to a baccalaureate- or master’s-level education through its partnership with seven universities, including Old Dominion, UVA, Radford, and Virginia Tech. VHCC has transfer agreements with 23 colleges and universities, and specific articulation agreements with East Tennessee State University, Old Dominion University, King College, and Radford University. Part of the Virginia Community College System, Mountain Empire sits on 95 picturesque acres in Big Stone Gap, a tiny town in the westernmost corner of the commonwealth. MECC is a comprehensive school serving the residents of the nearby city of Norton and Dickenson, Lee, Scott, and Wise counties. More than 3,600 students attend, enrolled in dozens of transfer degree, professional certification, and workforce training programs, from 3D design to welding. Many classes are available online. MECC stands out among community colleges in Virginia as it has a larger population of full-time students (46%) than most schools and more students pursuing tech programs than most schools. About a third take night courses. Almost 15% are over the age of 35. The Virginia Small Business Development Center is located on campus and provides free business consulting as well as workforce training. MECC has a full slate of transfer agreements and articulation arrangements with Virginia colleges. The school also offered two-year grants to four-year schools and has an innovative “Quick Start to College” program, which educates area residents on what to expect as they move to post-secondary education. Part of the Riverside Health System in Newport News, which includes seven hospitals, doctor’s offices, nursing homes, clinics, and specialists, Riverside College of Health Careers is a two-year school offering degree programs in a variety of fast-growing health care disciplines. Students can choose from associate degree and certificate programs in nursing, radiologic technology, surgical technology, physical therapy assisting, and medical assisting. The school’s 300 students attend classes at a campus three miles from Riverside Regional Medical Center, which serves as the clinical practice facility. Built in 2005, the campus features 85,000 square feet of classrooms, labs, computer labs, and library facilities. Many students move on to jobs in the Riverside Health System. Day programs follow 13-week semesters; evening and weekend classes last 20 weeks. Online options are also available. Transferability depends upon the program -- Riverside has some transfer agreements, but because of the specialized nature of the school, it’s not the same as at other community colleges in Virginia. LFCC is the public junior college of Frederick, Warren, Shenandoah, Page, Fauquier, Clarke, and Rappahannock counties, and the city of Winchester. It’s a large, diverse, geographic region and LFCC meets the need with four facilities: Middletown and Fauquier Campuses, the Luray-Page County Center, and Vint Hill. The school offers 75 degree and certificate programs to more than 9,500 students; the general studies, liberal arts, and business administration degrees can all be completed online. LFCC offers the traditional healthcare, education, business, and liberal arts programs that can be found at all two-year colleges in Virginia, and it also has extensive programming in engineering, IT, and less common specialties like sign language, nature photography, and philosophy. Classes are small, averaging around 25 students. LFCC has guaranteed transfer agreements with more than 40 schools, offering a pathway to a baccalaureate degree. The school prides itself on affordability and claims to be 1/3 of the cost of the average public, four-year school. Founded in 1970, Southside serves the largest area of Virginia community colleges, providing higher education to 10 counties and the city of Emporia. The school is one of the 23 two-year institutions in the Virginia Community College System and has nine campuses spread across the southern part of the state. About 8,000 students attend, pursuing associate degrees, working toward professional certification, or continuing their education in non-credit courses. The average age is 27; most students have jobs and attend school part-time. SVCC offers evening and weekend classes and a virtual campus to fit busy schedules. SVCC’s transfer degree programs include: administration of justice, business administration, education, science, human services, general studies, and general studies with an agribusiness specialization. The school also provides workforce development education for area business, teacher recertification, continuing-ed for contractors and tradesmen, truck driver training, apprenticeships in IT and trades, and institutional effectiveness research. Transfer agreements with 20 colleges and universities in the commonwealth make it easy to move on to a four-year school, and students can explore all their options with the handy Virginia Education Wizard app. Founded in 1972 as part of the Virginia Community College System, PVCC serves Charlottesville and several surrounding counties, including Buckingham, Greene, and Nelson. The school’s 7,500 students can select from more than 40 fields of study, including associate degrees for transfer to a four-year school, certificates for career-advancement, continuing education, and training for the workforce. Most students are enrolled part time and are under the age of 25. More than 90% of graduates of 2015 intended to continue their education at the baccalaureate level. PVCC has become known for its cooking program -- it has a state-of-the-art facility in downtown Charlottesville -- and for associates of art specializations in music, theater, and art. The school has been recognized on the national level as one of the best community colleges in Virginia for military personnel. Every year, more than 1,300 students transfer from Piedmont to a bachelor’s program, thanks to agreements with all of the public universities in the commonwealth and many of the private schools. More than 1,400 registered nurses, most of whom work in the school’s service area, have graduated from PVCC. Established in 1967 as part of Virginia Polytechnic Institute, Dabney S. Lancaster Community College serves an area larger than Rhode Island. It’s the local two-year college for students from Alleghany, Bath, Botetourt, and Rockbridge counties. A satellite center is in Rockbridge, and the school has a full slate of online programming. A publicly funded institution and part of the system of Virginia Community Colleges, DSLCC was named for a local educator. The school enrolls around 1,600 students, 60% of whom attend part-time. DSLCC offers 12 degree and 36 certificate programs, in business, the liberal arts, nursing, and general studies as well as such wide-ranging fields as forestry, wind-turbine technology, microcomputer operations, forensics, and private security services. The school is especially known for its culinary arts program. It’s been ranked among the best community colleges in Virginia, and is known for its small class sizes (the average is 10) and for access to professors (student to faculty ratio is 13:1). The school has proven to be a good investment -- for every state or local dollar spent it returns $2.89 to the Commonwealth. Richard Bland College is unique among Virginia community colleges. Founded as an extension of the College of William and Mary, the Petersburg-based school is now run as a standalone institution with oversight from William and Mary. It was the first junior college in the state to offer residency options. Its campus is an 825-acre former dairy farm and is home to the largest pecan grove in the commonwealth. Unlike most junior colleges, where a long tradition of career-oriented vocational and technical education attracts many, Richard Bland’s 2,300 students follow a transfer degree track, heavily influenced by William and Mary’s liberal arts curriculum. In many ways, it’s like being a freshmen or sophomore at a four-year liberal arts school. RBC offers associate degrees in the arts, business administration, math, computer science, physical science, life sciences, and lab science. It also has special programs in logistics, Army logistics, and project management. Though affiliated with the College of William and Mary, RBC has 50 direct-transfer agreements with public and private schools across Virginia. A Student Support Team provides tutoring, counseling, and advising. Located in the northern Virginia city of Fredericksburg, with additional campuses in Locust Grove, Stafford, and Culpeper, GCC is a comprehensive public, two-year institution founded in 1970. As one of the 23 community colleges in Virginia’s system of higher ed, GCC provides 7,000-some students with access to dozens of degree, certificate, and professional-development programs in four divisions, including arts and sciences, nursing health technologies, professional technical studies, and workforce. All of the transfer programs require students to take general education -- English, history, humanities, math, and physical education -- which will transfer to most four-year colleges and universities. GCC has guaranteed admission agreements with dozens of schools across Virginia and beyond, including an arrangement with Old Dominion online that leads to baccalaureate degrees. Transfer counselors help guide students through the transfer process. The Germanna Presents! Lyceum events series brings performers, speakers, and arts organization to the community. Set in the Richmond area, JTCC is one of the largest community colleges in Virginia with a student body of close to 14,000. The public two-year institution is part of the Virginia Community College System and receives funding from both the state and local levels. JTCC has campuses in Midlothian and Chester, and runs a nursing center in Richmond. More than 80% of students attend part time. JTCC offers 20 degree programs, along with dozens of professional certificates and continuing education, including all of the liberal arts, humanities, business, nursing, and education courses expected at today’s junior colleges. It’s also become known for its funeral services major and Cisco Networking degree. The school has been recognized nationally for its high transfer rates, STEM programming, and online ed. It runs the Community College Workforce Alliance, which does professional training, education, skills assessment, and economic development, in partnership with Reynolds Community College. John Tyler prides itself on affordability and claims its tuition is just over a third of what a student would pay to attend a public four-year school. It offers an innovative Textbook Free Degree program that substitutes eBooks for traditional textbooks and can save a student as much as $2,000. Everything about NOVA is big. Located in the suburbs of Washington, DC, the comprehensive community college is largest of all two-year colleges in Virginia. In fact, it’s the biggest public school of any kind in the state and the second-largest community college in the nation. With more than 76,000 students representing 180 nations, it’s among the most diverse schools in the country. And it’s growing -- graduation rates were up 64% over 2009-2010. Around 62% of students attend part time. NOVA offers more than 160 degree, certificate, and professional programs; among the most popular are general studies and liberal arts, business management and marketing, and social sciences. The college has state of the art health-care facilities at its Medical Education Campus in Springfield. More than 11,000 students participate in the distance learning program, taking classes on NOVA’s virtual campus. Many also participate in the school’s extensive internship program, which provides an opportunity to get into the workforce, earning credit and valuable experience. A global studies arm encourages students to study abroad and integrate with the international students on campus. NOVA enjoys guaranteed admission agreements with more than 40 colleges and universities, including a special arrangement with George Mason. Dr. Jill Biden, wife of former Vice President Joe Biden, teaches English at NOVA. Not to be confused with a junior college of the same name in North Carolina, BRCC is a public two-year school in the central Shenandoah Valley. Part of Virginia’s Community College System, BRCC has a main campus is in Weyers Cave, a healthcare center at Augusta Health in Fishersville, and a virtual campus online. The college enrolls 4,000 students, more than 80% of whom study part time, and more than half of whom are in a college-transfer program. BRCC has the usual complement of associate and certificate programs, from accounting to welding, and also offers less common fields like aviation maintenance technology, aging-in-place specialist, and mechatronics. The school has articulation agreements with some four-year institutions, including the UVA School of Engineering and Applied Science, the University of Mary Washington, and Virginia Tech College of Agriculture & Life Sciences and College of Engineering. Guaranteed admission agreements include Bridgewater and Mary Baldwin colleges, and Eastern Mennonite, George Mason, James Madison, Longwood, Old Dominion, and Shenandoah Universities. BRCC also has an online learning arrangement with Old Dominion which allows students to finish their bachelor’s degree from the Shenandoah Valley. It also has partnerships with other Virginia community colleges to offer culinary arts, funeral services, radiologic tech, and respiratory therapy. Based in Lynchburg, CVCC offers more than 80 transfer degree programs and occupational and technical training to a service area of more than 228,000 people. Part of the Virginia Community College System, the school’s region includes the cities of Lynchburg and Bedford. The 4,400-member student body is split approximately in half between students on transfer and career tracks. Most take advantage of the school’s flexible scheduling and attend part time. General studies is by far the most popular major, with education and business following. Like many two-year colleges in Virginia, the school has transfer agreements with many colleges and universities and guaranteed-admission programs with Old Dominion, George Mason, and James Madison universities. CVCC also participates in the VCCS transfer program, and it’s part of the Virginia two-year grant program, which uses $1.8 million in funds allocated to help students move on to a four-year school. Local Lynchburg College sees the most CVCC transfer grads. One of the 23 schools in the Virginia Community College System, SWCC was founded in 1968 to provide postsecondary education to the residents of Buchanan, Dickenson, Russell, and Tazewell counties. Based near Richland, the school serves more than 3,700 annually. A comprehensive community college, SWCC offers dozens of transfer degree, career-oriented certification, continuing education, and distance learning options. The school has guaranteed admission arrangements with almost all public and private four-year universities in the commonwealth. As with most community colleges in Virginia, first-year students must take a placement assessment in English and math. Graduates of the associate degree programs may be eligible for up to $2,000 in transfer grant money when moving on to a four-year school. In 2016, the school received a $1.4 million federal grant to retrain displaced coal miners. From a 70-acre campus in southwest Roanoke, VWCC offers dozens of degree and certification programs to more than 12,700 students. Third largest of the two-year colleges in Virginia’s Community College System, the school was established in 1966 to provide educational opportunities to the residents of Salem, Roanoke, Craig, Botetourt, and Franklin counties. The most popular programs are general studies, nursing, health sciences, business, and science. The campus continues to grow with a state-of-the-art Center for Science and Health Professions, a new student center, and a STEM facility under construction. VWCC participates in the VCCS transfer program and has several articulation and guaranteed admission agreements universities including Old Dominion, James Madison, Radford, and Purdue. The school is a community focal point, hosting events, a public art gallery and arboretum, and a popular MET Opera series. Vets can get information and advising at the Military Services Center. Danville is one of the oldest community colleges in Virginia with roots dating back to 1890 and the Danville Military Institute. The campus in Danville was then home to an extension of the Virginia Polytechnic Institute and the Danville Textile School, until becoming a part of the Virginia Community College System in the 1960s. Today it’s home to about 5,000 students, pursuing transfer degrees and occupational certification in dozens of fields. About 40% of those enrolled are in transfer programs; 18% on certificate or professional tracks. Almost a third of students are over the age of 25. Among the most popular fields of study at DCC are general studies, liberal arts, the health professions, and engineering. The school has more than a dozen extracurricular groups, including Phi Theta Kappa and the student government association. Along with 14 other community colleges, DCC participates in the Rural Virginia Horseshoe Initiative, which aims to raise the overall educational level in many of the state’s less populous counties. The school’s Transfer Center provides advising and assistance to students interested in moving on to a four-year school. The Danville Knights baseball team has won the Virginia Community College championship several years running. The Carrington Child Development Center offers on campus child care. Named after one of the founders of International Paper company, a local education supporter, PDC has campuses in Franklin and Suffolk and a learning center in Smithfield. Part of the larger Virginia Community College System, the school offers a popular associate in general studies along with more than 60 other transfer degree and vocational programs in business, administrative and office support, education, the health sciences, technology, computing, public safety, and industrial technology and the trades. About 1,800 students are enrolled. Many of the programs at PDC have “stackable” credentialing -- students can earn a certificate and then move onto other certificates or a two-year degree. Certificates typically take between 30 and 59 credits, and associate in the arts and sciences or applied sciences require more than 60. Almost 70% of students receive some sort of financial aid. As at most Virginia community colleges, a dual enrollment program allows area high schoolers to get a jumpstart on their college education. PDC has transfer agreements with several four-year, public and private colleges and universities. With campuses in Hampton, Williamsburg, and Newport News, TNCC serves the residents of the Virginia Peninsula. It’s one of the 23, public, two-year schools in the state’s community college system, and offers 50 associate degrees and more than 60 certificate programs to 14,000 students. TNCC is unusual among community colleges in Virginia in that almost 4,000 students are affiliated with the military. About half of students are in transfer-degree programs. Liberal arts and general studies are the most popular majors followed by business and the social sciences. The school also is noted for its nursing, mental health, and automotive programs. In addition to its guaranteed admission agreements with 30 Virginia schools, TNCC has partnerships with the University of Virginia and William Mary, giving students an opportunity to co-enroll in a four-year school. Like most community colleges, it offers dual-enrollment to area high schoolers and continuing-ed to seniors. Students on campus can choose from 15 clubs and join the school’s baseball and basketball teams. NRCC is among the oldest two-year colleges in Virginia. Founded in 1959 as the New River Vocational Technical Center, the school merged with the Virginia Community College System in the late 60s. Today, NRCC has over 2,700 students enrolled in 27 degree and certification programs at its main campus in Dublin and its center at the New River Valley Mall in Christiansburg. The main Dublin campus is a grassy, 100-acre site; the space at the mall features 14 classrooms and is geared toward STEM education. NRCC also has an extensive online learning campus. Most students are in transfer degree programs, and the most popular major by far is liberal arts and humanities followed by industrial production technology and nursing. NRCC has allied with Old Dominion University to offer a direct transfer program -- students take the first two years of their schooling at NRCC and finish with a bachelor’s from ODU online. They also have guaranteed-admission with Radford University, which is the most popular school among NRCC grads, and several agreements with Virginia Tech. An active fiddle, banjo, and dance club honors the musical heritage of the New River Valley by bringing big-name bluegrass acts to campus. J. Sargeant Reynolds Community College offers programs developed in partnership with business, industry, and senior colleges. Students attending the college, which is located in Richmond, can choose associate degrees in disciplines such as construction and manufacturing, health professions and nursing, information technology, and the liberal arts and social sciences. Students can complete two-year programs in accounting, management, administration of justice, fire science technology, and paralegal studies. Reynolds, one of the top community colleges in Virginia, provides the necessary general education coursework that can be applied to most four-year programs. Areas of study specifically designed for transfer include business administration, engineering, science, and social studies. The school's unique programs include an associate of applied science in American sign language with a focus on English interpretation. TCC is one of 23 colleges within the Virginia Community College System. The school serves residents in South Hampton Road with four campuses in Norfolk, Chesapeake, Portsmouth, and Virginia Beach. TCC also operates seven regional centers that each emphasize particular areas of study such as visual arts, automotive technology, and the health professions. The school enrolls over 34,000 students each year in career and technical education, transfer, associate, and certificate programs. Students planning to transfer to a four-year institution can earn an associate of science degree in fields such as engineering, business administration, social sciences, or general studies. Students can also earn an associate of arts in disciplines such as communications, political science, or history. Those who want to immediately enter the workforce as technicians or paraprofessionals can pursue an associate of applied science in a CTE field. As one of the top community colleges in Virginia, TCC offers several clubs and organizations that allow students to pursue different causes, develop leadership skills, and have an active social life. If you're thinking about applying to one of the best colleges in Virginia, continuing reading to learn more about living in the Old Dominion State. Officially the 'Commonwealth of Virginia,' this South Atlantic state of 8,014,955 was the first British Colonial possession, and as such, is rich in history and artifacts. It also contains the oldest (continuously running) government system in the US. With that background, it is no surprise Virginia has been selected multiple times by the Pew Research Center as having the most effective and efficient state governing body. Beyond politics and history, Virginia is home to an array of natural attractions and contains varied climate and topography enough to keep any outdoor enthusiast entertained. To the east is the Atlantic coastline, including the Eastern Shore (the southmost part of Delmarva Peninsula), which is a habitat for wild ponies and also includes a NASA launch site. To the west, George Washington and Jefferson National Forests provide camping, hiking and mountaineering inside over 230,000 acres of old-growth trees and a total of 1.8 million acres of parkland. Below, we've outlined the distinct regions of Virginia and their individual highlights. With Virginia's wealth of top schools and beautiful landscapes, establishing residency prior to enrollment is a great idea for students who have decided to pursue an education in the state. Keep in mind, required criteria may vary at each institution ― use the information below as a baseline guide to help you get started. For students under 18, residency status depends on their parents. To be considered a resident, the individual's parents must live in Virginia, and the minor must live with the parent or parents. If they are divorced or separated, the student must live with the parent who resides in Virginia. Proof of parental residency must be established prior to a minor's enrollment, as well as proof that the minor lives with this parent. To be eligible for Virginia residency for the purpose of tuition, the following criteria must be met before the first day of the quarter you plan to enroll in. You must live Virginia for 12 consecutive months, during which you must prove you are not in the state exclusively for educational purposes. Proof of residency (beyond educational purposes) can be proven by documentation of citizenship activities, such as a state driver's license, voter registration, vehicle registration and so on. You must relinquish all legal ties to your former state of residence. If you are on active military duty and stationed in Virginia, you may be eligible for immediate residency status.